250mm engineers file set. Includes flat, round and half round 2nd cut files. Soft grip handles. 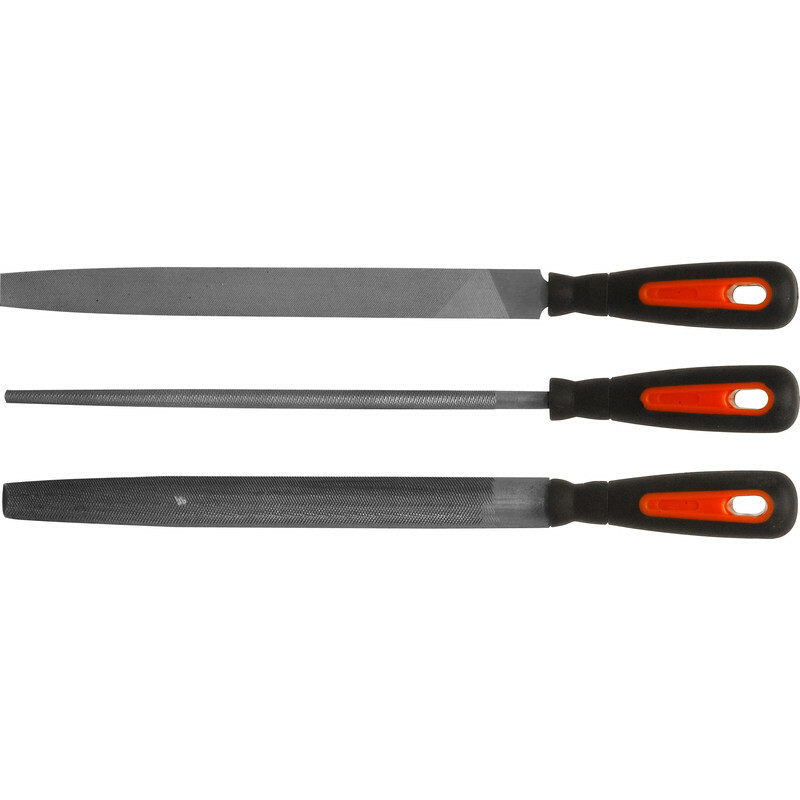 File Set 250mm (3 Piece) is rated 3.8 out of 5 by 10. Rated 4 out of 5 by Anonymous from Seem great quality Not used yet but seem sharp and robust. Rated 5 out of 5 by Aerialman 1 from Basic file set, Good price. Have used one or two of this set and they work as they should. Medium cut set and can recommend. Rated 1 out of 5 by Sir Martin from Not as the catalogue I ordered this from the catalogue, which advertised these as second cut ( and showed three files with yellow handles ). When I collected them, I asked why the handles were not yellow ( I don't mind the colour, but I wanted the correct item ). Also they looked rough, not second cut. When I got home, I checked them again & found that they were not second cut. I returned them. I found the staff helpful both times. Rated 4 out of 5 by Old dog new tricks from Good budget files. My collection of files has been borrowed longterm by No.1 son, so needed a file set pronto - Toolstation obliged. Good basic files for rough work. Rated 5 out of 5 by Anonymous from File Set Great product, Great Service! Rated 4 out of 5 by magnie from Good hand files The files appear to be of good quality but would have preferred to have a smooth file in the selection. Rated 5 out of 5 by Mac Man from Good value Bought for general garage/workshop use. Have good comfortable handles.